In a room that was too small for the purpose, because there was standing room only for the academic colleagues, past and current students who came together for Susan Halford’s ex-augural lecture. Susan has left Southampton to be Professor of Sociology at the University of Bristol and it soon became clear that the room was, in fact, full of her friends. Friendships born of fierce academic contention and a shared grappling for clarity that occurs when viewpoints from different disciplines come together to co-construct knowledge. Wendy Hall introducing Susan reminded those present that the Web wasn’t invented by Tim Berners Lee rather it was co-constructed by any number of people who took the technology, used it, adapted it and envisioned it to accomplish what they purposed. The Web has never been a single person’s vision and as such it has proved impossible to predict the future of the Web and yet Susan was urging all present to actively consider the future. A future with Artificial Intelligence, increasing reliance on robotics, a changing Webiverse or with whichever branch of emerging technologies we are working. Yet predicting the future is really difficult for, as Susan reminded us, there are no universal laws; a fully objective neutral viewpoint is impossible and all research is driven and shaped by political, social, financial, technical and other forces. No wonder we struggle. Susan was on fine form, delighting in the opportunity to draw together and share some of her current thinking; to have playful swipes at some simplistic ideas she would banish and concluding with an entreaty for us all to take positive action to envision the future. The challenge is to think differently about the future. The future is neither predetermined nor under any forces of determinism. But nor is the future conjured out of nothing. It comes about from the past and present within highly complex socio-technical systems. Susan argued that the future is often envisaged and steered by powerful privileged actors: political bodies, international institutions, tech giants and so forth. But its direction is not a forgone conclusion. For many of the futures we are currently being ‘sold’ by various vested interests are simply what large commercial organisation are hoping will come true, because of their investment in particular futures. Yet there is always the possibility of unexpected trends and events which cannot be predicted. The first was a warning from the past. Susan cautioned about the way public opinion, supported by the press, has taken so strongly against Genetically Modified foods. This has effectively resulted in the withdrawal of investment into GM foods in Europe. It is all too easy for public opinion to turn against technologies. Next could be AI, robotics, nanotechnology or whatever. If the public take against a technology, possibly with due provocation, then funding could dry up. There will not have to be too many Cambridge Analytica type outrages for trust with technology to be broken. We must tread with care and make true cases for the technologies we work with. Second, technologies don’t change the world. The world though may be changed by technologies and people. We must keep on addressing the socio-technical challenges. Technological solutions alone will not create any future. Finally, the future will not lie within any single discipline; be it computer science, technology, sociology or whatever. The Web Science Institute has demonstrated that collaboration across and between disciplines; the sharing of models, theories and technologies are the intersections where genuine progress can be made. Collaboration is difficult, but Susan implores us to keep on with interdisciplinary work. We have the privilege, as the elite, to envision future worlds shaped by technologies but perhaps the greatest challenge is how can we bring in other voices, possibly of the disadvantaged, to co-construct futures that will actually benefit everyone? 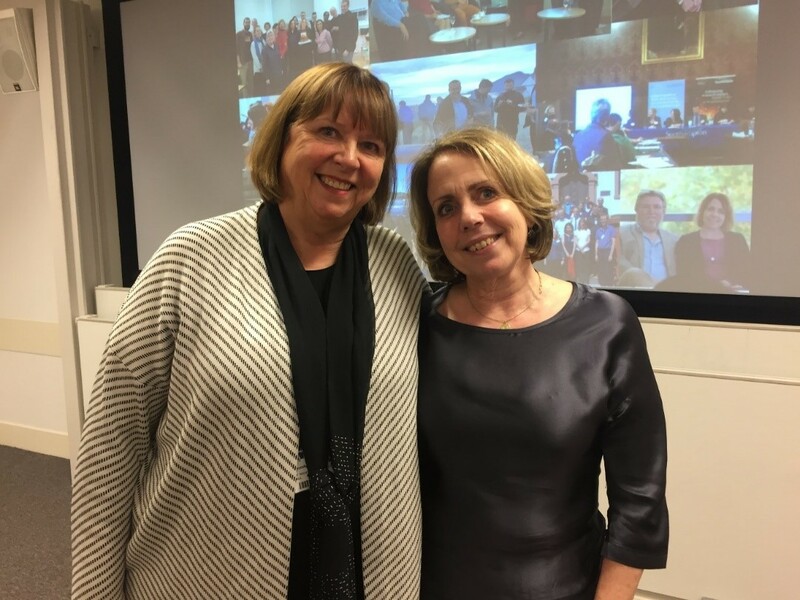 Susan has left the University of Southampton but there will be many opportunities for colleagues here to continue to benefit from her insight, challenge and wisdom. We wish her well.